The travesty of last year’s Venice Film Festival may be old news, but it bears repeating now that Kelly Reichardt’s glorious slow-burn western, which had its world premiere at the Italian shindig, is finally rolling into UK cinemas. Two equally cool, contemplative and plot-neutral films – ‘Meek’s Cutoff’ and Sofia Coppola’s ‘Somewhere’ – competed for the Golden Lion. One was universally lauded and touted as the surefire winner. The other was dismissed as shallow, self-regarding and meaningless. And the wrong film won. The sheer gulf of quality and intention between these two superficially similar films couldn’t be wider. The ‘cinema of nothing’ that both Reichardt and Coppola practice may be currently in vogue, but their approaches to it differ wildly: where Coppola uses the camera to reflect her own celebrity-centric interests, Reichardt’s gaze is firmly fixed on the outside world, and particularly on those poor souls who have lost their place within it. ‘Meek’s Cutoff’ is a western, but it’s like no horse opera you’ve ever seen. Michelle Williams plays Emily, one of a small band of settlers wagon-training west, keeping their eyes peeled for Indian raiders. But with supplies dwindling and tough-talking guide Meek (Bruce Greenwood) looking increasingly out of his depth, the group reluctantly turn to a captured Cayuse warrior (Rod Rondeaux) for guidance. Employing the same stylistic restraint and sense of inexorably mounting tension she perfected in ‘Old Joy’ and the heartbreaking ‘Wendy and Lucy’, Reichardt creates a mood which is at once entirely believable and entrancingly otherwordly. The period trappings, sparse dialogue and hard-bitten performances feel utterly credible: from the long, wordless opening scene of the settlers lugging their possessions across a shallow river, ‘Meek’s Cutoff’ feels like a sepia-toned snapshot of a bygone era. And yet, in the emptiness and endlessness of the landscape and in the sheer helplessness of its few inhabitants, there’s a disconnect from modern reality which is powerfully unsettling. Comparisons could be drawn with the opening act of ‘Picnic at Hanging Rock’, but Reichardt‘s vision has little of the beauty and all of the threat: where Peter Weir relied on camera trickery and a haunting score to create a sense of nature’s implacability, Reichardt is a staunch realist, shooting straight and letting the setting and the situation speak for themselves. The result is bold, unrelenting and wilfully oblique, perhaps to a fault: Reichardt’s refusal to provide easy solutions may be thematically appropriate, but it can be alienating. Nonetheless, ‘Meek’s Cutoff’ is one of 2011’s singular cinematic experiences: subtle, simple and devastating. Saddle up. i have seen this film twice now. first at the LFF where i was amazed at how bad it was, and last week on TV where i was able to fast forward through the substantial boring , dark and mumbling bits. yet, it is a film with some wonderful ideas and cinemaphotography and creates a more realistic vision of what 19th century travellers life was like. 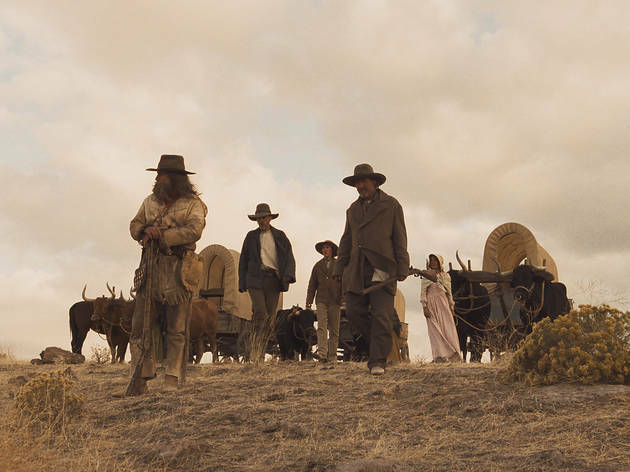 the use of static shots, silence /natural sound and just ordinary movement creates a totally different feel to the usual visuals we see with the Hollywood western. this is nto a 'western' though , it is a film about people ina time and place and thus does nto need to follow the conventions of the genre. so whilst i applaud this part of the film it is still one of the most boring and unefiying films i have seen in years. it needed mor edrama and character to keep the interest and thos einterminable night shots of mumbling in the dark could easily send one to sleep. i woudl rather see Ford's wagonmaster made some 60 years ago . If I could claim back the two hours of my life off the producers of this utter rubbish I would. If I could give it no stars I would. It never gets going and it doesn't really end. It's three middle chapters of a bad twelve chapter book. I'm sure there's people that will call it art but if so it should be on a fridge door of an obliging parent. It may be slow moving, but it is a film to immerse oneself in. The landscapes are stunning and the authenticity of the situation and the acting really give the viewer the opportunity to feel the story. The introduction of the native American also gives the film a suprising level of tension and interest. For those looking for a taste of the "real" west, this mystical and far out western really delivers. The conclusion may be a bit of a kick in the teeth, but this film is all about the journey. Fair point Tony. Equally, you're entitled to your view about the film and that doesn't make it a good one. I don't usually post to forums etc but just felt I needed to offer a 'Joe public' riposte to some of the negative comments made here. The film has a measured pace and deliberately avoids action bonbons and narrative cliches. Instead it provides both a picture of what the trek westwards was probably like for many, and a meaningful meditation on humility, resistance and humanity. The visual motif of puny human marks on an unforgiving landscape will stay with me for a long time. Some people clearly don't like it, and so it was when I saw it, with groans etc at the end. OK, they are entitled to their view, but that doesn't make it a bad film. Ian, I couldn't agree with you more. Archipeligo still gets my vote for the worst film ever, but this runs it a very close second. The cinematography (a sort of moving National Geographical) would have been nice to watch for about ten or fifteen minutes. Otherwise it was a complete waste of time and money. I've never commented online about a film before, but I want my money back and I'm going to let as many people know that I possibly can. This film is terrible. I needed to go to the loo halfway through this film and it was like an onslaught to the senses compared with the pace of this movie. I agree wholeheartedly with mark ratcliff, The only thing I was looking forward to some kind of resolution (it was my greatest hope for something actually happening) and even that wasn't forthcoming. An absolute copout in the name of an open ending. I only wish I could get my money, and the time back that I wasted on this unbelievable shocker. I was interested by the film but it didn't make much of it's 1 and 3/4 hours. The people are in a predicament from which they haven't escaped at the end. The characterisation of the women seemed a bit broad given all the time they had to play with (the nervy one, the ballsy one, the frail but gutsy one). There wasn't much characterisation for the men at all. It often looks good but it's a bit thin. This was a wonderful film. Really beautiful, meditative and lyrical. The acting was superb - loved Bruce Greenwood, almost unrecognisable from his usual roles of handsome charmers. It is so refreshing to have a film revel in ambiguity and that doesn't feel the need for constant revelations every scene. The slow, accumulation of events and small moments create a wonderfully realised and rich world. 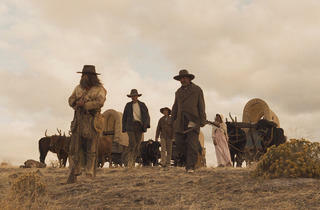 It's a kind of anti-cliche western. And a western with women in central roles. Marvelous.